Mosul, Iraq (AINA) -- Kurdish soldiers carried out a search operation in Assyrian homes in Mosul between September 15 and the beginning of October, confiscating weapons the families were keeping for protection. The confiscations and searches were only carried out in Assyrian homes, especially in the Al Sakr and Al Bakr neighborhoods. One man, speaking on condition of anonymity, says he was the only non-Muslim in his neighborhood. Soldiers from the mainly Kurdish Second Army Unit in Mosul came to his house in three military vehicles, ordering him to surrender any weapons he had. They did not approach any other residents of his neighborhood. Several other Assyrians (also known as Chaldeans and Syriacs) AINA interviewed told a similar story. AINA has learned that agents from the Kurdish Asayesh intelligence service are currently confiscating ration cards of families who have fled from the violence in Mosul (AINA 10-16-2008) to the Nineveh Plain. The families are told the only way for them to retrieve their ration cards is to remain permanently in the Nineveh Plain. Several independent sources have accused the two dominate Kurdish political parties of staging the attacks against Assyrians for political reasons. Several Iraqi MPs have pointed out the KDP party, headed by Massoud Barazani, is responsible (AINA 10-17-2008). Media reports of the events in Mosul assumed the killings were the work of Al Qaeda, overlooking several facts which not only indicate Kurdish involvement but also disclose the close connection between the events in Mosul and the interests of the Kurdish political parties in north Iraq. On October 19 Iraqi MP Yonadam Kanna, a native of northern Iraq, said 90% of the attacks occurred in the areas which are under the control of the second army unit in Mosul. The second army unit in Mosul is composed almost exclusively of Kurds. A Times article quotes a Christian woman who put the blame on Kurdish paramilitaries, saying: "I suspect they were Peshmerga [armed Kurdish fighters] because their Arabic was broken and they looked like Kurds." A Reuters reporter stated, after speaking to Assyrians in the town of Alqush in the Nineveh Plain, "Some blame Islamic militants, while others quietly point a finger at Mosul's politically powerful Kurdish minority. Most are too frightened to go into details." Six individuals have been arrested in connection with the Mosul attacks, including four Kurdish men affiliated with the Kurdistan Democratic Party (KDP) in north Iraq (AINA 10-17-2008). The US military has so far declined to confirm the capture of the four KDP affiliated men. The killings against the Assyrians of Mosul began on October 4 with the murder of two Assyrians (AINA 10-08-2008). Twelve more Assyrians were killed in the subsequent two weeks and direct threats were sent via mobile phone text messages, leaflets, and loud speakers, telling the Assyrians to leave or be killed. Simultaneously, several Assyrian church leaders in the city of Dohuk, which lies inside Kurdish controlled area, were informed by Kurdish intelligence agents, known as Asayesh, that they had captured a terrorist cell in Mosul which had pictures of their churches, though no proof was provided. The church leaders were told there are direct threats directed towards their church buildings and community in Dohuk and they should be cautious. The word spread among the Assyrians in Dohuk, putting the community in a state of panic and fear. The churches, in coordination with the Kurdish affiliated organization called The Popular Council of the Chaldean Syriac Assyrians, (PCCSA) increased security around all churches in the Dohuk province. PCCSA is a Kurdish funded group (AINA 7-24-2008) set up in 2007 in Arbel. 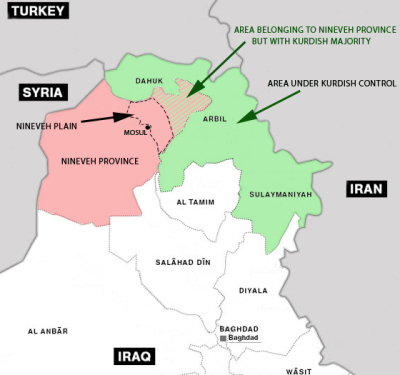 The group works to annex the predominantly Assyrian Nineveh Plain into the Kurdish administered area. Rumors started circulating in Dohuk that the Assyrians in Mosul would face a massacre on October 9. People were encouraged to inform their relatives to leave the city. One of the priests who ordered his parishioners to urge their relatives to leave Mosul is Father Quryaqos, from the village of Shioz, just outside the city of Dohuk. Father Quryaqos said he was instructed by Mr. Jamel Zeyto, the leader of PCCSA, to say they were warned to leave Mosul by their relatives. On October 15 the Christian finance minister of the Kurdish region, Mr. Sargis Aghajan, said in an interview in the arabic internet site ankawa.com, which is read mainly by Assyrians, that the Kurdish Regional Government (KRG) has amended its constitution to allow the Assyrians to have administrative rights if they vote to join the Nineveh Plain into the Kurdish region. The Kurdish finance minister has not announced the news about the amendment in any other media outlet. The evidence points to a political motive behind the Mosul events. The aim seems to be to increase Kurdish political influence in Mosul ahead of any provincial elections by driving out the Assyrian community. While the KRG is portraying itself as the true protector of Assyrians, it appears to be driving them to vote for the annexation of the Nineveh Plain to the Kurdish controlled area.